Two of the recent international documents concerning the future of the Global South should attract the attention of the foreign policy observers in India for several reasons. 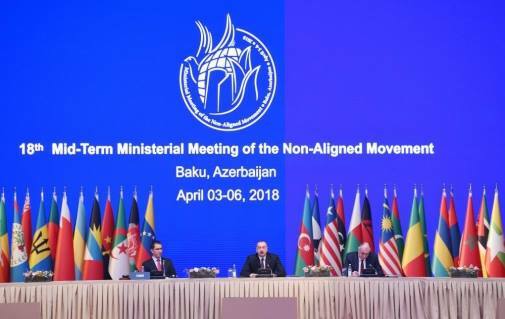 One is the Baku Declaration of the 18th Mid-Term Ministerial Meeting of the Non-Aligned Movement (NAM), held in Azerbaijan during 3-6 April 2018. The other is the Communiqué of the Commonwealth Heads of Government Meeting (CHOGM) issued on 20 April in London. While the NAM represents the Global South (home to 55 per cent of the world’s population), an assorted conglomerate of the world’s 120 poorest as well as the developing/emerging economies, the Commonwealth has fifty three countries (home to 2.4 billion people) spanning over Africa, Asia, the Americas, Europe and the Pacific. These Commonwealth countries also include the world’s largest, smallest, richest and poorest countries (thirty-one are classified as small states – countries with a population size of 1.5 million people or less and larger member states that share similar characteristics with them—and there are Global North countries such as Britain, Canada, Australia, New Zealand etc). The Baku Declaration could be seen as a prelude to the XVIIIth NAM to be held in Azerbaijan in 2019. The CHOGM Communiqué came as a sequel to a plethora of global and regional issues snowballed over a period of time. While India’s Minister for External Affairs, Sushma Swaraj, represented India at the Baku Conference, Prime Minister Narendra Modi made it a point to attend the CHOGM held in London. Modi, rather, used it as an occasion to explore a deepening relationship with Britain in a post-Brexit scenario. Observers have already raised questions concerning India’s priorities in a messy international situation which badly affects Global South’s existence. When Modi did not attend the XVIIth NAM summit held in Venezuela in 2016, he became the first Indian prime minister to do so (an exception could be Charan Singh who was only a caretaker prime minister when the Havana Summit was held in 1979). It remains to be seen if this will be repeated in 2019 at Baku (if Modi is in power). However, the South Block’s perceptions and attitudes get influenced by the NAM’s reiteration of the Global South’s changing priorities and interests. Sushma Swaraj told the Baku Conference that the fundamental values and principles on which the NAM is based are “even more relevant today.” She said that the movement “epitomises our desire to carve out a space of autonomy in policy making” (India, MEA 2018). No doubt, one of the cardinal features of non-alignment, as conceptualized by India, was “freedom of action” and “independence in decision making.” Nehru elaborated this notion further by saying that, ultimately, this independence would mean independence in economy policy making and that our nation would not be a satellite of any country in the world. But does this framework of thinking hold any relevance today? Will the ‘windfalls of globalisation’ allow the South Block managers to take a different position—different from the North Block agenda? The Baku Conference, however, expressed serious “concern over the adverse impacts of the global financial and economic crisis on global trade through, inter alia, rising protectionism, in particular, in developed countries which negatively affects exports of developing countries.” The reference to “rising protectionism” is obviously a pointer to the policy regime of Donald Trump. The Baku Declaration says that “a successful conclusion of the Doha Development Round, launched in 2001, can only be achieved if the outcomes thereof significantly address the imbalances and inequities in the multilateral trading system, in which the interests of developing countries could be reflected, as well as the need to fulfill of previous commitments” (Azerbaijan, Ministry of Foreign Affairs 2018). Again, the question is if the NAM could effectively address “the imbalances and inequities in the multilateral trading system” without raising the fundamental problems of the global economic architecture and its governance pattern unleashed by the forces of globalisaion. There was a time when the Global South countries could carry on a relentless struggle to protect their economies from global capital penetration. Their main agenda of global negotiations sought to bring in fundamental restructuring of international financial institutions such as the IMF and World Bank, besides seeking equitable share in world trade. However, over years, the Global South countries had all come under pressure to shelve the Charter for a New International Economic Order (NIEO) once and for all (Seethi 2018; Seethi & Vijayan 2009). No wonder, countries like India never picked up this NIEO agenda in the post-1991 scenario. Consequently, the North-South dialogues, once envisaged under the NIEO, were a forgotten process and hence the South-South cooperation became, eventually, a slogan of reinforcing the current pattern of trade and commerce without questioning the prevailing imbalances and unequal exchanges in the North-South ties. Interestingly, the Baku Conference reiterated that “South-South Cooperation is an important element of international cooperation for the sustainable development of their peoples, as a complement and not as a substitute to the North-South Cooperation, which allows for the transfer of appropriate technologies, in favourable conditions and preferential terms.” Thus, the South-South Cooperation became merely an “expression of solidarity and cooperation among the peoples and countries of the South” (Azerbaijan, Ministry of Foreign Affairs 2018). It is an indication that the Global South has become a passive stakeholder even in the era of ‘new-protectionism’ of the New Right regimes in the world. Countries like India hardly consider this as a major challenge to their own dream of a ‘free and fair’ North-South relations. They don’t put up even a reasonable resistance to the one-way traffic of global trade where the interests of the Global South are continuously sacrificed. The denial of access to the Global North markets is a patent discrimination under the ‘free and fair’ trade. Yet the Global South hardly recognizes the importance of a joint fight for a just and equitable world order. Naturally, Sushma Swaraj’s claim that the NAM “epitomises our desire to carve out a space of autonomy in policy making” (India, MEA 2018) has become a mere rhetoric. However, a major relief in the Baku Declaration is its reiteration of support for a serious and collective efforts “to bring a complete end to the Israeli occupation of the Palestinian territory occupied since 1967, including East Jerusalem, in accordance with and in full respect of international law, including international humanitarian and human rights law, and the relevant United Nations resolutions, including Security Council resolutions 242 (1967), 338 (1973) and its most recent resolution 2334 (2016).” The Declaration also condemned “the illegal policies and practices by Israel, the occupying Power, against the Palestinian people, including, inter alia, the construction and expansion of illegal settlements, the demolition of Palestinian homes and properties, the acts of collective punishment against the civilian population, including the imprisonment and detention of thousands of civilians, disruptions of normal flow of people and traffic through various security checkpoints, closures, and barricades, as well as the illegal blockade of the Gaza Strip.” It particularly noted and condemned the violence by the Israeli occupation forces during the commemoration of the Land Day in Gaza on 30 March 2018. The Baku Conference urged the world community “to act swiftly to avert the further dangerous deterioration and destabilization of the situation and to fulfill, without delay, the historical, political, legal and moral responsibilities towards the question of Palestine, including in support of the Palestinian people’s realization of their inalienable rights, including to self-determination and freedom in their independent State of Palestine, with East Jerusalem as its capital, on the basis of the pre-1967 borders.” Moreover, the Baku Declaration condemned all measures taken by Israel to alter the legal, physical and demographic status of the occupied Syrian Golan. It also demanded that “Israel should abide by resolution 497 (1981), and to withdraw fully from the occupied Syrian Golan to the borders of 4 June 1967, in implementation of resolutions 242 (1967) and 338 (1973)” (Azerbaijan, Ministry of Foreign Affairs 2018). However, there is a message for India too, in the Baku Declaration. It underlined the need “to promote tolerance and respect for diversity and the need to seek common ground among and within civilizations in order to address common challenges to humanity that threaten shared values, universal human rights and the fight against racism, racial discrimination, xenophobia and related intolerance, through cooperation, partnership and inclusion” (Ibid). It may be noted that the Modi Government has been widely criticized for its policy of intolerance and the discriminatory policies towards minorities and Dalits in India. Like the Baku Declaration, the CHOGM 2018 also expressed its concerns of “the risks of protectionism to the global economy and underlined the importance of resisting all forms of protectionism.” While reaffirming “their commitment to free trade in a transparent, inclusive, fair, and open rules-based multilateral trading system, which takes into account the special requirements of least developed countries and small and vulnerable economies, the Communiqué reiterated “their support for finding solutions to the remaining Doha Development Round issues. All Commonwealth WTO members agreed to ratify and work towards timely implementation of the WTO Trade Facilitation Agreement in their own countries; and agreed to consider providing programmes of capacity building and other targeted interventions in developing countries” (The Commonwealth 2018). Obviously, the task set before the majority of the Global South countries in the Commonwealth is to reinforce the prevailing unjust trade order so that, as the Communiqué declared, “the goal of expanding investment and boosting intra-Commonwealth trade to US$2 Trillion” could be realized by 2030. However, the Communiqué recognized that some small states, particularly Small Island Developing States, “continue to suffer disproportionately from diseconomies of scale, external economic shocks and catastrophic climatic events, which significantly and gravely impact their economies and societies.” Hence the Commonwealth urged “action in addressing these challenges, including issues of unsustainable debt, limited access to development financing and other threats posed to their socioeconomic development.” With this end in view, the Communiqué called on the world community “to support measures, including effective debt management and transparency, which help to alleviate these vulnerabilities and challenges” (Ibid). But will this happen under the existing global economic governance which has only bitter pills under neoliberal prescriptions? Interestingly, the CHOGM also noted with concern that “the practice of ‘de-risking’ threatens to exclude small and other vulnerable states from accessing global financial markets and regulated financial services, and may constrain their ability to trade internationally.” Hence the Communiqué called for “sustained international, regional and national efforts to identify effective solutions to combat ‘de-risking,’ and to preserve the financial inclusion of small and other vulnerable states in the global economy” (Ibid). The experience of many of the least developed countries is too well known. For them, ‘financial inclusion’ means a long-term debt trap with no possibilities of delinking from the global pattern of exchange relations. Though small states constitute over 60 percent of the Commonwealth’s membership, the leaders who assembled in such meetings seldom recognized the basic problems of these small states, and has consistently eschewed any serious efforts to bring out the real issues. Rather many of them would look upon the Global North within the Commonwealth as the ultimate savior! India (with its nearly 40,000 Rohingya refugees) should have been in the forefront of taking up this issue with a humanitarian ground. Unfortunately, the Modi Government’s position has been very negative on this issue, and the Sangh Parivar organisations unleashed a campaign against them, which considerably affected the image of India as a ‘host with a heart.’ It may be noted that even in the Supreme Court, the Union Government claimed that India was not accountable on grounds of its global commitments. In an affidavit, the Government said: “That the provisions of Convention Relating to the Status of Refugees, 1951 and Protocol Relating to the Status of Refugees, 1967 cannot be relied upon by the petitioner since India is not a signatory of either of them. It is respectfully submitted that the obligation concerning the prohibition of return/non-refoulement is a codified provision under the provisions of 1951 Convention referred to above. It is submitted that this obligation is binding only in respect of the States which are parties to the Convention. Since India is not a party to the said Convention, or the said Protocol, the obligations contained therein are not applicable to India.” The UN high commissioner for human rights, Zeid Ra’ad Al Hussein, had criticized the Union Government’s position and deplored the moves in India “to deport Rohingyas at a time of such violence against them in their country” (The Wire, 18 September 2017) on grounds of “national security threat.” In any case, with the CHOGM 2018, it has become a moral obligation on the part of India to ensure the safety and protection of Rohingyas within the country. The Baku Declaration and the CHOGM 2018 Communiqué are debatable documents for many counties in the Global South—like India—for more than one reason. While there are welcome statements—of commitments in regard to migration, refugees, illegal occupation, international crimes, intolerance etc—in the documents, there are fundamental existential issues which have not been seriously addressed by the two. The XVIIIth NAM is scheduled to be held in Baku in 2019 even as the world is witnessing a plethora of issues concerning the Global South. However, it remains to be seen if these underprivileged countries can think about alternative strategies in dealing with multiple issues of trade, technology transfer, market access and currency transactions. Most profoundly, the question of autonomy in policy making cannot be compromised anymore here, as a large number of countries in the Global South are now expected to start ‘policy-disaster management’ measures at home, consequent upon the overreach of the “Washington Consensus” over years. Seethi, K.M. and Vijayan P. (2009): “The Political Economy of India’s Third World Policy,” in Rajen Harshe and K.M. Seethi (eds. ), Engaging with the World: Critical Reflections on India’s Foreign Policy, New Delhi: Orient Blackswan.